Eric Perez and his wife, Mari, live with their five children in the Wenatchee Valley in central Washington state. Their house is just feet from an orchard. A couple of years ago, the kids were having an Easter egg hunt in the yard when they smelled something "plasticky," Perez remembers — like "rotten eggs." Perez says they realized the orchard must have been sprayed while the family was away for their Easter lunch. Perez says they got stomachaches, started throwing up and having trouble breathing and got diarrhea and scratchy throats. "I think we all went to the doctor," he remembers. 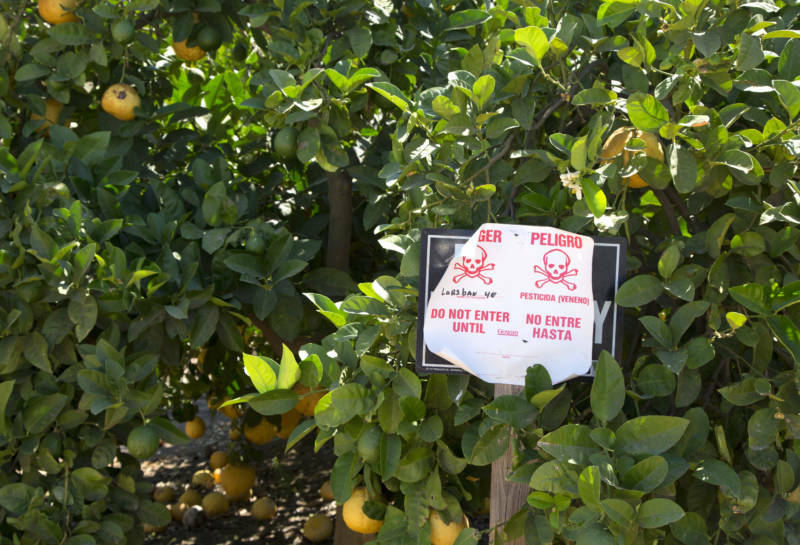 Washington's Department of Agriculture investigated and found evidence that a pesticide called chlorpyrifos had drifted onto the Perez's property from the neighboring orchard. Crops like apples, corn, soybeans and Christmas trees are sprayed with chlorpyrifos. The Environmental Protection Agency decided to phase the popular pesticide out of household use back in 2000, but it's still allowed in agriculture. Now, the 9th U.S. Circuit Court of Appeals will decide whether the EPA has to ban it. When chlorpyrifos drifts onto farmworkers and rural residents, the immediate symptoms can include "nausea, vomiting, diarrhea, abdominal cramps, muscle weakness, muscle twitching, coughing, wheezing," says Richard Fenske, a University of Washington professor who has studied the chemical. For babies and children, the pesticide can be even more dangerous. "There are developmental effects in children and in the fetus during pregnancy," he says. "We may see slower learning, not making progress in school as quickly as other students." Specifically, children with more chlorpyrifos in their blood at birth and in early childhood scored lower on memory, verbal comprehension and reasoning tests. They also had lower IQs and higher rates of attention deficit hyperactivity disorder and impulsive behavior than children exposed to less chlorpyrifos. EPA scientists recommended a total ban on the chemical. But in March 2017, President Trump's new EPA administrator at the time, Scott Pruitt, decided against that. A group of environmental and farmworkers organizations that want a total ban sued the EPA. Last August, a three-judge panel ruled 2-1 that the EPA had to ban chlorpyrifos. But the EPA appealed that decision, and now the full 9th Circuit is reconsidering the ruling. Farmers applaud that decision, saying they need chlorpyrifos. Sean Gilbert is a fifth-generation farmer in Yakima, Washington. He grows apples and other tree fruit. He says he sometimes uses chlorpyrifos in his orchards. "It will primarily go after a pest called scale," Gilbert says. "Scale irritates the skin of the apple and creates bright red spots on it. It would look like it had the measles." "Scale, in particular, if left unchecked can kill your tree," says Betsy Beers, an entomologist at Washington State University who studies pest management. "So it is something that growers have to take very seriously." Not just apple growers use chlorpyrifos. Christmas tree farmers also depend on the chemical; they use it to kill aphids, which can leave trees black, gnarled and pretty much unsellable. Beers says there are alternatives to chlorpyrifos, but they're more expensive. "We can't count on there being an effective replacement coming anytime soon," she says. It's unclear how much chlorpyrifos residue remains on fruit and Christmas trees when they reach consumers. One study found chlorpyrifos derivatives in the urine of kids who eat produce that is not labeled organic. But there's no evidence linking that level of exposure to actual harm. In the Wenatchee Valley, Eric Perez got tired of the pesticide blowing over onto his house. "I saw my kids go to the doctor so many times," he says. "I failed them as a parent." He wishes he had said or done more, sooner, to keep the chemical away from his family. A year and a half ago, in September 2017, he bought the orchard next to his house. Now it's farmed organically. The 9th Circuit is scheduled to hear oral arguments in the case against the EPA on March 25. Tony Schick of Oregon Public Broadcasting contributed to this story.